Mammals are vertebrate animals constituting the class Mammalia, and characterized by the presence of mammary glands which in females produce milk for feeding (nursing) their young, a neocortex, fur or hair, and three middle ear bones. These characteristics distinguish them from reptiles and birds, from which they diverged in the late Triassic, 201–227 million years ago. There are around 5,450 species of mammals. The largest orders are the rodents, bats and Soricomorpha. The next three are the Primates, the Cetartiodactyla, and the Carnivora. In early embryogenesis of most eutherian mammals, the inner cell mass is the mass of cells inside the primordial embryo that will eventually give rise to the definitive structures of the fetus. This structure forms in the earliest steps of development, before implantation into the endometrium of the uterus has occurred. The ICM lies within the blastocoele and is entirely surrounded by the single layer of cells called trophoblast. A morula is an early-stage embryo consisting of 16 cells in a solid ball contained within the zona pellucida. The millimetre or millimeter is a unit of length in the metric system, equal to one thousandth of a metre, which is the SI base unit of length. Therefore, there are one thousand millimetres in a metre. There are ten millimetres in a centimetre. Embryonic stem cells are pluripotent stem cells derived from the inner cell mass of a blastocyst, an early-stage pre-implantation embryo. Human embryos reach the blastocyst stage 4–5 days post fertilization, at which time they consist of 50–150 cells. Isolating the embryoblast, or inner cell mass (ICM) results in destruction of the blastocyst, a process which raises ethical issues, including whether or not embryos at the pre-implantation stage should have the same moral considerations as embryos in the post-implantation stage of development. Researchers are currently focusing heavily on the therapeutic potential of embryonic stem cells, with clinical use being the goal for many labs. Potential uses include the treatment of diabetes and heart disease. The cells are being studied to be used as clinical therapies, models of genetic disorders, and cellular/DNA repair. However, adverse effects in the research and clinical processes such as tumours and unwanted immune responses have also been reported. The zona pellucida is a glycoprotein layer surrounding the plasma membrane of mammalian oocytes. It is a vital constitutive part of the oocyte. The zona pellucida first appears in unilaminar primary oocytes. It is secreted by both the oocyte and the ovarian follicles. The zona pellucida is surrounded by the cumulus oophorus. The cumulus is composed of cells that care for the egg when it is emitted from the ovary. A zygote is a eukaryotic cell formed by a fertilization event between two gametes. The zygote's genome is a combination of the DNA in each gamete, and contains all of the genetic information necessary to form a new individual. In multicellular organisms, the zygote is the earliest developmental stage. In single-celled organisms, the zygote can divide asexually by mitosis to produce identical offspring. In cell biology, mitosis is a part of the cell cycle when replicated chromosomes are separated into two new nuclei. Cell division gives rise to genetically identical cells in which the number of chromosomes is maintained. In general, mitosis is preceded by the S stage of interphase and is often accompanied or followed by cytokinesis, which divides the cytoplasm, organelles and cell membrane into two new cells containing roughly equal shares of these cellular components. Mitosis and cytokinesis together define the mitotic (M) phase of an animal cell cycle—the division of the mother cell into two daughter cells genetically identical to each other. 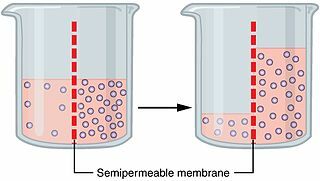 Osmosis is the spontaneous net movement of solvent molecules through a selectively permeable membrane into a region of higher solute concentration, in the direction that tends to equalize the solute concentrations on the two sides. It may also be used to describe a physical process in which any solvent moves across a selectively permeable membrane separating two solutions of different concentrations. Osmosis can be made to do work. Osmotic pressure is defined as the external pressure required to be applied so that there is no net movement of solvent across the membrane. Osmotic pressure is a colligative property, meaning that the osmotic pressure depends on the molar concentration of the solute but not on its identity. Zona hatching is a phenomenon occurring during prenatal development. 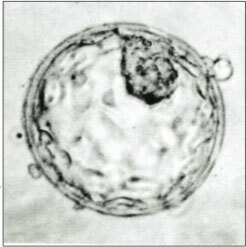 Prior to this event, the predecessor of the embryo, in the form of a blastocyst, is surrounded by a glycoprotein sphere called the zona pellucida. To be able to perform implantation on the uterine wall, the blastocyst first needs to get rid of the zona pellucida. 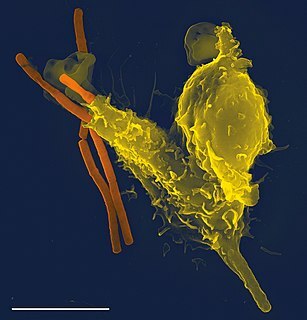 This lysis of the zona pellucida is called the zona hatching. This happens at the end of day four. Once the ICM has been established within the blastocyst, this cell mass prepares for further specification into the epiblast and primitive endoderm. This process of specification is determined in part by fibroblast growth factor (FGF) signaling which generates a MAP kinase pathway to alter cellular genomes. Further segregation of blastomeres into the trophoblast and inner cell mass are regulated by the homeodomain protein, Cdx2. This transcription factor represses the expression of Oct4 and Nanog transcription factors in the trophoblast. These genomic alterations allow for the progressive specification of both epiblast and primitive endoderm lineages at the end of the blastocyst phase of development preceding gastrulation. Much of the research conducted on these early embryonic stages is on mouse embryos and specific factors may differ between mammals. The use of blastocysts for human in vitro fertilization has proved successful and is a common option for couples unable to conceive naturally. A blastocyst is implanted five to six days after the eggs have been fertilized. After five or six days it is much easier to determine which embryos will result in healthy live births. Knowing which embryos will succeed allows just one blastocyst to be implanted, cutting down dramatically on the health risk and expense of multiple births. Now that the nutrient requirements for embryonic and blastocyst development have been determined, it is much easier to give embryos the correct nutrients to sustain them into the blastocyst phase. The endometrium is the inner epithelial layer, along with its mucous membrane, of the mammalian uterus. It has a basal layer and a functional layer; the functional layer thickens and then is shed during menstruation in humans and some other mammals, including apes, Old World monkeys, some species of bat, and the elephant shrew. In most other mammals, the endometrium is reabsorbed in the estrous cycle. During pregnancy, the glands and blood vessels in the endometrium further increase in size and number. Vascular spaces fuse and become interconnected, forming the placenta, which supplies oxygen and nutrition to the embryo and fetus. The speculated presence of an endometrial microbiota has been argued against. In mammals, pregnancy is the period of reproduction during which a female carries one or more live offspring from implantation in the uterus through gestation. It begins when a fertilized zygote implants in the female's uterus, and ends once it leaves the uterus. The blastula is a hollow sphere of cells, referred to as blastomeres, surrounding an inner fluid-filled cavity called the blastocoele formed during an early stage of embryonic development in animals. Embryo development begins with a sperm fertilizing an egg to become a zygote which undergoes many cleavages to develop into a ball of cells called a morula. Only when the blastocoele is formed does the early embryo become a blastula. The blastula precedes the formation of the gastrula in which the germ layers of the embryo form. Mammalian embryogenesis is the process of cell division and cellular differentiation during early prenatal development which leads to the development of a mammalian embryo. A blastocoel is a fluid-filled cavity that forms in the animal hemisphere of early amphibian and echinoderm embryos, or between the epiblast and hypoblast of avian, reptilian, and mammalian blastoderm-stage embryos. Trophoblasts are cells forming the outer layer of a blastocyst, which provide nutrients to the embryo and develop into a large part of the placenta. They are formed during the first stage of pregnancy and are the first cells to differentiate from the fertilized egg. This layer of trophoblasts is also collectively referred to as "the trophoblast", or, after gastrulation, the trophectoderm, as it is then contiguous with the ectoderm of the embryo. A germ layer is a primary layer of cells that forms during embryonic development. The three germ layers in vertebrates are particularly pronounced; however, all eumetazoans produce two or three primary germ layers. Some animals, like cnidarians, produce two germ layers making them diploblastic. Other animals such as chordates produce a third layer, between these two layers. making them triploblastic. Germ layers eventually give rise to all of an animal’s tissues and organs through the process of organogenesis. The gestational sac is the large cavity of fluid surrounding the embryo. During early embryogenesis it consists of the extraembryonic coelom, also called the chorionic cavity. The gestational sac is normally contained within the uterus. It is the only available structure that can be used to determine if an intrauterine pregnancy exists until the embryo is identified. Embryonic development also embryogenesis is the process by which the embryo forms and develops. In mammals, the term refers chiefly to early stages of prenatal development, whereas the terms fetus and fetal development describe later stages. The cytotrophoblast is the inner layer of the trophoblast. It is interior to the syncytiotrophoblast and external to the wall of the blastocyst in a developing embryo. In embryology, Carnegie stages are a standardized system of 23 stages used to provide a unified developmental chronology of the vertebrate embryo. In amniote animal embryology, the epiblast is one of two distinct layers arising from the inner cell mass in the mammalian blastocyst or from the blastodisc in reptiles and birds. It derives the embryo proper through its differentiation into the three primary germ layers, ectoderm, mesoderm and endoderm, during gastrulation. The amnionic ectoderm and extraembryonic mesoderm also originate from the epiblast. Bilaminar blastocyst or Bilaminar disc refers to the epiblast and the hypoblast, evolved from the embryoblast. These two layers are sandwiched between two balloons: the primitive yolk sac and the amniotic cavity. Hormonal regulation occurs at every stage of development. A milieu of hormones simultaneously affects development of the fetus during embryogenesis and the mother, including human chorionic gonadotropin (hCG) and progesterone (P4). Morphokinetics (‘morpho’’ form/shape and ‘kinetics’ movement) refers to time specific morphological changes during embryo development providing dynamic information on a fertilized egg. The detailed information eases morphological selection of embryos with high implantation potential to be used in In-Vitro Fertilisation treatment. Repeated Implantation failure (RIF) is the failure of the embryo to implant onto the side of the uterus wall following IVF treatment. Regularly, this happens at 6-7 days after conception and involves the embedding of the growing embryo into the mothers uterus and a connection being formed. A successful implantation can be determined by using an ultrasound to view the sac which the baby grows in, inside the uterus. ↑ Zhang, Shuang; Lin, Haiyan; Kong, Shuangbo; Wang, Shumin; Wang, Hongmei; Wang, Haibin; Armant, D. Randall (2013). "Physiological and molecular determinants of embryo implantation". Molecular Aspects of Medicine. 34 (5): 939–80. doi:10.1016/j.mam.2012.12.011. PMC 4278353 . PMID 23290997. ↑ Gasperowicz, M.; Natale, D. R. C. (2010). "Establishing Three Blastocyst Lineages – Then What?". Biology of Reproduction. 84 (4): 621–30. doi:10.1095/biolreprod.110.085209. PMID 21123814. ↑ Wang, Jeff; Sauer, Mark V (December 2006). "In vitro fertilization (IVF): a review of 3 decades of clinical innovation and technological advancement". Therapeutics and Clinical Risk Management. 2 (4): 355–364. doi:10.2147/tcrm.2006.2.4.355. ISSN 1176-6336. PMC 1936357 . PMID 18360648.